The impetus for this project was the conversion of a heritage-listed house into a work-live space for a couple who work from home. The design employs an industrial aesthetic, using simple connections and robust materials for the addition, as a counterpoint to the Victorian articulated decoration found on the existing exterior. In a subtle gesture to the ornate exterior, the cladding uses variation in proportion and cadence to alleviate the otherwise monolithic quality of the panelling. The interior was reconfigured so as to allow a sealed off area for client consultations, while two specific private areas, a library and a study, were provided upstairs for work. The project provided us with an opportunity to develop an integrated work-live environment that preserved the character of the existing Victorian house, while also expanding the connection between the house and rear garden. Through a renovation to an existing heritage-listed house, we consciously introduced modern formal elements that could co-exist with the character of the house. 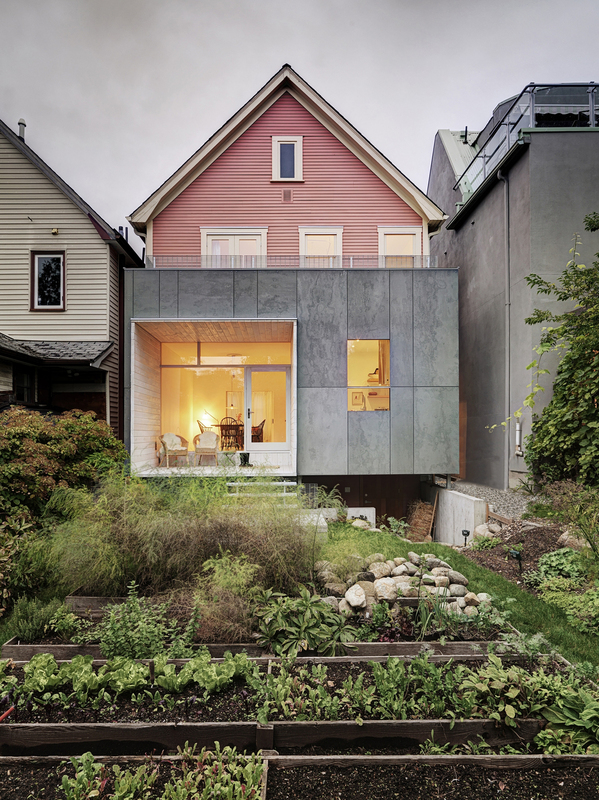 A porch on the back of the house that had been converted into exterior space was removed and the space reconfigured to provide a private exterior space in this dense urban neighbourhood. In addition, the timber-lined aperture that connects the productive garden to the living spaces and acts as a light box that introduces light deep into the house while also providing a sense of privacy.